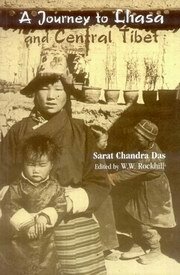 A Journey to lhasa and Central Tibet is a record of explorer Sarat Chandra Das' travels through Sikim into Tibet during the year 1879-1891. Das is considered as one of the greatest pioneering travellers who ever entered Tibet. The marvelous primary resource - later edited by W.W. Rockhill - covers Das' journey from Darjeeling to Tashilhunpo, his residence there, on to Dongtse, and his onward journey to Lhasa via Tashilhunpo and Yamdo Samding. From his time at Lhasa, he gives details about the government of Lhasa, their customs, festivals, and culture. He records his return journey to Tashilhunpo and Ugyen-Gyasto's visit to the Bonbo Sanctuary of Rigyail Sendar. He describes in detail the funeral of Panchen Rinpoche, his visit to the Great Lamasery of Samye and to Yarlund. His visit to Sakya is also recorded, and his subsequent return to India, where he explored the idea of social divisions, marriage, funerals, medicine and festivals of Tibet. This book is a witness to Sarat Chandra Das' tremendous work, and is an example of what a travelogue should be.